Arthur H. Whiteley was a man who greatly appreciated art and science, and generously supported both endeavors at FHL and in the Department of Zoology at UW. He began his career doing physiology, but later was known as a sea urchin developmental and cell biologist. Arthur died April 15th, 2013, at his home in Seattle after a short illness. He was 96 years old and touched many lives in his lifetime. Learn more about Arthur H. Whiteley. The Whiteley’s careers were intimately involved in the remarkable growth of the Departments of Microbiology and Zoology, and of FHL where they frequently combined their efforts in study of molecular problems in sea urchin development, and to which they retreated for thinking, analysis, planning and writing. These ‘retreats’ are what inspired Arthur Whiteley to create the Helen Riaboff Whiteley Center. Helen R. Whiteley immigrated with her parents from Harbin, Manchuria, to the United States in 1923 following the revolution in Russia. She lived in Seattle, later moved to San Francisco, and enrolled at the University of California, Berkeley. Helen, as a student, and Arthur Whiteley, as teaching assistant, began their careers together in a course in cellular biology in the Department of Zoology. Helen completed her bachelor’s degree at Berkeley in Microbiology, Chemistry, and Zoology, worked in the laboratory at Children’s Hospital, San Francisco, then was head of the Public Health Lab in Flagstaff, Arizona. During a six month period when Arthur was a post-doctoral at the University of Texas Medical School at Galveston, Helen earned an M.A. degree in Microbiology and Dermatology at the same institution. Thereafter followed a year in Pasadena, California, where Arthur was a postdoctoral fellow in the laboratory of Dr. Albert Tyler at Cal Tech, and Helen did research in a microbiology laboratory in Pasadena. 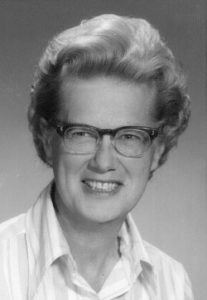 In the summer of 1947, when Arthur started as an Assistant Professor in the Department of Zoology at UW, Helen enrolled as a Ph.D. candidate in the Department of Microbiology of the newly formed School of Medicine. Her Ph.D. was completed in 1951 under Dr. Howard Douglas followed by postdoctoral research with Dr. Erling Ordal, both of the UW Department of Microbiology. She studied further with Dr. C. B. Van Niel at the Hopkins Marine Station of Stanford University. Her career progressed through an NIH Career Development Award, an NIH Research Career Award, Professorship at UW in the Department of Microbiology, Chairman of the Division of Physiology of the American Society for Microbiology, Vice President and President of the American Society for Microbiology, and then 10 years of service as Chairman of the Publications Board of that important society. She served as Chairman of the US side of the US-USSR Joint Working Group in Microbiology for five years. With Helen’s attainment of the NIH Research Career Award, which required issuance of tenure from UW, the University changed its long standing policy prohibiting employment of husband and wife as faculty members – a removal of restrictions that has benefited many facets of this academic community. Helen’s research focused on several aspects of bacterial physiology, most recently on transcriptional control, structure of RNA polymerases, and determination of the molecular structure, the control, and the expression of the crystalline protein gene in Bacillus thuringiensis. Arthur will be remembered for his delineation of gene and protein expression in sea urchin embryos, his support of many students and colleagues, his nourishing of many developmental biology graduate students through the University-wide Developmental Biology Training Grant, his devotion to his wife Helen Riaboff Whiteley, and his founding of the Helen Riaboff Whiteley Center (HRWC) at FHL. This is a special place for creative work, open to scientists, artists, and writers, that has generated many special projects after 13 years in operation. Arthur was born of English immigrants in the natural lake and river setting of southeastern Michigan. His father ran a daily newspaper and was a State Senator and Commissioner of Conservation. 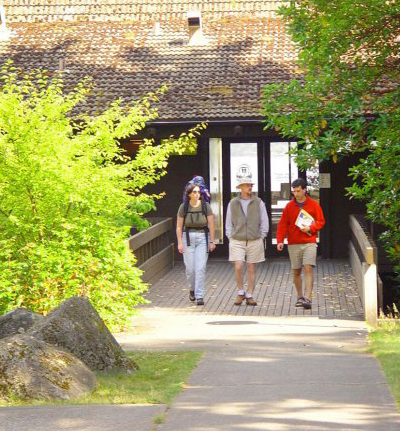 Conservation stuck with Arthur as he fought strongly for the restriction of salmon farming in Puget Sound from the 1980s to 2006 as President of the Marine Environmental Consortium-United States and Chairman of the San Juan Nature Institute (2006). Arthur received a B.A. in biology from neighboring Kalamazoo College and an M.S. in zoology from the University of Wisconsin. During these studies he worked in the field for the Michigan State Department of Conservation and studied limnology at the Douglas Lake Biological Station, perhaps inspired by a microscope he was given as a boy. In Madison he changed his interest from limnology to cell biology, for which he is famous not only for his studies, but for his teaching. He arrived in class with a huge stack of bound journals to show the students original studies from the literature. His erudition influenced not only his students but also subsequent instructors like Gerald C. Karp, the author of cell biology textbooks who as a graduate student published with Arthur on gastropod gene expression. 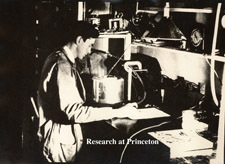 Arthur began his Ph.D. research at the University of California Berkeley with Sumner Cushing Brooks, pioneering studies on 32P in biology. There he met Helen Riaboff. In 1942 he moved to Princeton University to study the war-related subject of bends as it applied to aviators. He published 14 papers with E. Harvey Newton on bubble formation during skeletal muscle activity and its amelioration by pre- oxygenation. During this time he showed his joy in tinkering with and inventing laboratory equipment. After a year at the University of Texas Galveston, he found his life’s studies on sea urchin embryos at California Institute of Technology with Albert Tyler, an eminent sea urchin biologist. In 1947 he began his career at UW where he joined several Berkeley colleagues, including Robert Fernald, who ran FHL for many years. At FHL, Arthur set up his own summer laboratory and developed with Robert Fernald and Richard Cloney the Comparative Invertebrate Embryology Course. His first paper on sea urchins with Edward L. (Ted) Chambers and Brooks in 1948, showed the activation of a protein carrier for rapid ATP-dependent uptake of phosphate at fertilization. For a period Arthur’s attention turned to metabolic enzymes with studies with Jean J. Comita, John W. Brookbank, J. B. Lichfield, Hironobu (Ed) Ozaki, and finally Eizo Nakano in Japan (1962). Arthur’s work expanded to the DNA and RNA content of sea urchin embryos and his collaboration with Heinz and Karen Holter during a Guggenheim Foundation Fellowship in 1955. 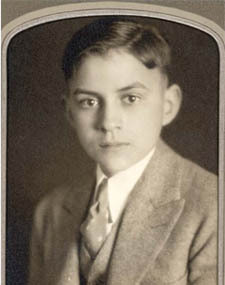 He established close friendships with Fritz Baltzer, Alberto Monroy, Max Møler, and Vance Tarter, his introduction to Stentor which he later studied with Ann James Frazier. His sabbatical in 1962 Japan sealed enduring friendships with Japanese colleagues including Katsuma Dan, Jean Dan, Eizo Nakano, and Motonori (Ghen) Hoshi to whom he brought the technique of protein gel electrophoresis. Exchanges between Seattle and Japanese scientists continued with his encouragement throughout his career, including a 1981 US-Japan Symposium he organized at FHL. In Seattle Arthur encouraged the studies of other invertebrates in his laboratory including tunicates (Charles Lambert) and Pacific oysters (K. W. McLean). With colleagues at the UW, including Helen R. Whiteley and Brian McCarthy, Arthur continued through the rest of his academic career to study developmental and evolutionary changes in the gene program of echinoderm, especially with his former graduate student and collaborator Michael A. Harkey. He was known for giving his students an idea and letting them run with the projects. Such collaborations with his graduate students and postdocs were on uridine uptake (Joram Piatigorsky), histone expression (Douglas P. Eaton), the hatching enzyme (Richard M. Showman), activation of protein synthesis (Merrill B. Hille), and finally a focus on primary mesenchyme expression in sea urchins with Shigeki Mizuno, Yang Rim Lee, John Chamberlain, John Speith, Bruce Drager, Mineo Iwata, and Helen R. Whiteley. 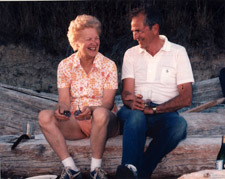 Arthur and Bill Rutter of the Department of Biochemistry established the still existing University of Washington NIH Interdepartmental Developmental Biology Training Program in 1963. He directed the Program until 1985. He also founded the NW Regional Developmental Biology meetings sponsored by NSF and the Society for Developmental Biology held annually at FHL. Arthur continued to celebrate his interests in scholarly achievements and exchanges. His last research paper was with Rosalie Langelan Duncan in 2011. He has had the first species of a new Nemertian genus named after him. Last summer he participated in the inauguration of six Japanese scholars to the E. S. Morse Institute for the exchange of scholars between the Friday Harbor Laboratories and marine laboratories in Japan. Arthur was made the first Honorary Scholar of this institute. Above all Arthur will be remembered for his support of the international community of sea urchin developmental biologists and of UW FHL, which he loved. 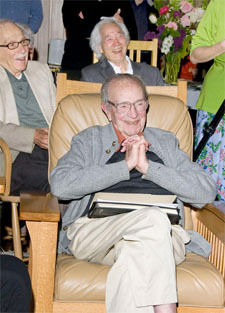 Arthur sat down with Dennis Willows for a few days in late May, 2011 to share his stories about his childhood, college days, the love of his life – Helen Riaboff Whiteley, his tenure at the UW and FHL. He also talked about the building of the HRWC and his passion for conservation. Watch the videos here.